LONG BEACH — The budget to repair a portion of the Port of Long Beach (POLB) damaged by Hurricane Marie just increased 20-fold, as commissioners overseeing the harbor unanimously approved an additional $3.8 million in spending Jan. 12 to fix broken infrastructure adjacent to the middle breakwater. Shortly after Hurricane Marie struck last summer, port officials approved $200,000 for harbor infrastructure repairs. That budget ballooned to $4 million with the Jan. 12 vote. Harbor commissioners approved the funding to pay for necessary repairs at a man-made peninsula by the one-time Naval Shipyard, Navy Mole Road, Pier F, Pier J South and the dike on Navy Mole. According to POLB staff, about $157,000 of the $200,000 budget was spent by Dec. 1, 2014. Commissioner Tracy Egoscue asked for an explanation of why the budget jumped from $200,000 to $4 million. POLB staff added they would attempt to seek reimbursement from the state and federal government. However, officials were unclear if any of the repairs are eligible for reimbursements. Commissioner Lori Ann Farrell asked whether the repair project would be eligible for federal assistance or reimbursement. According to POLB staff, savings incurred from a capital improvement project at Pier G would help pay for repairs near the middle breakwater, meaning the port did not have to cut funding from another line item with an approved budget to compensate for the infrastructure repairs. Harbor Commission Vice President Rich Dines said making repairs to the Navy Mole provides an opportunity to factor in future expansion plans. The Port of Long Beach was hit hard by Hurricane Marie in August 2014. News reports and POLB staff stated Hurricane Marie was the sixth most intense eastern Pacific hurricane on record, bringing “increased surf and storm surges to Southern California” and swells of 10 to 15 feet battering the coast. 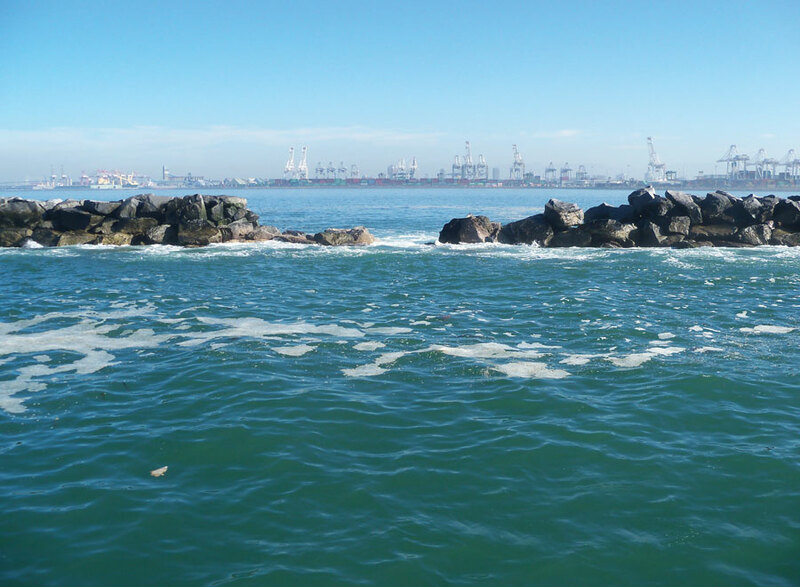 As a result, the Los Angeles-Long Beach Harbor suffered significant structural damage, the most notable along the middle breakwater in front of POLB. Swells breaching the middle breakwater ultimately damaged piers F and J, the Navy Mole and surrounding infrastructure.“The storm waves caused large amounts of debris to wash up on roads and train tracks, damaged dikes and undermined roadways,” POLB staff stated.